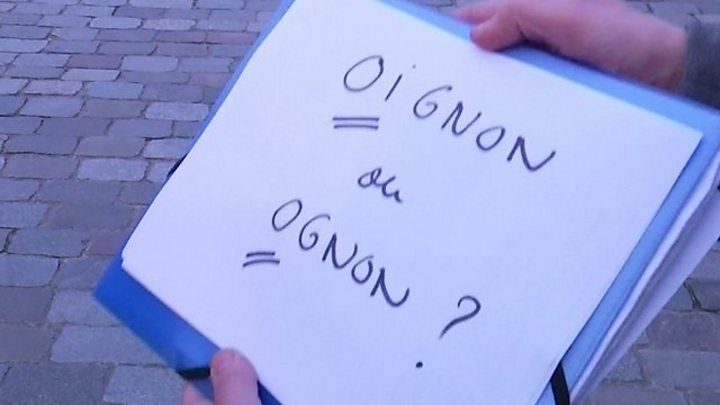 Suggested new spellings for more than 2,000 French words have sparked controversy. The Academie Francaise proposed changes in 1990, including the deletion of the circumflex accent (ˆ) and hyphens in some words, but they were optional. Now publishers say they will include the new spellings in schoolbooks. France's education minister has said the changes will not culminate in the end of the circumflex, and that old and new spellings will both remain correct. Despite this, the news sparked furious reaction on social media, with users arguing the changes constituted dumbing down. Some tweets even used the hashtag #JeSuisCirconflexe (I am circumflex). The peaked accent (^) looks like a hat, or so children are told when they are learning French. It goes over vowels - in some cases it changes the word's pronunciation, in others it serves to distinguish homonyms (words that are spelled and pronounced like another word but are different in meaning). The changes will see it being used on a, o and e, but dropped from i and u (with some exceptions). The outrage reportedly started after a report by the TF1 website (in French) said the reforms would take effect in the upcoming academic year. It quoted a note from the education ministry last year saying that the new spellings should be adopted and reported that publishers have decided to add the changes in textbooks from September. Students will then have a choice to use either the old spellings or the new ones and teachers will have to accept both ways as correct. The proposed changes followed a review of the French language to simplify learning, but they were not binding and had faced strong opposition in the country, Le Monde reported (in French). They include the deletion in some words of the hyphens and the circumflex. The accent disappears from above the letter i and u in certain words and not from the letter o. The new spelling would reportedly impact around 2,400 words. Users on social media were furious over the changes, and the hashtags #ReformeOrthographe (orthographic reform) and #JeSuisCirconflexe (I am circumflex) were one of Twitter's trending topics in France on Thursday. Many users shared pictures showing their dissatisfaction with the changes, and most of the anger was directed at the alleged end of the circumflex.